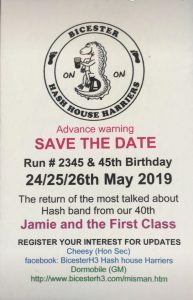 We are proposing to host another fantastic weekend next year to celebrate being the oldest weekly running Hash in the UK. We have the band/ venue / caterer booked. Please get your name down as soon as possible as numbers are limited. Beer, Cider at £1 a pint, wine at £1 per 125cc, lager at £1.50 a pint, softies free (subject to price variations) during entertainment.